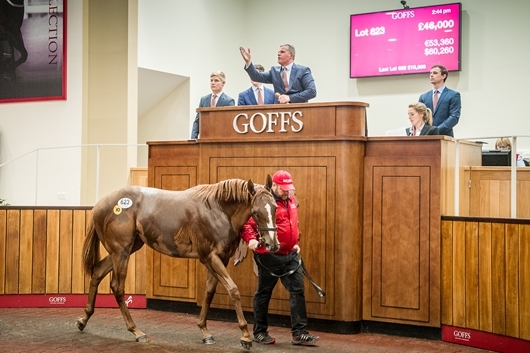 The Silver Sale saw the completion of Goffs UK’s August yearling sales with today’s auction seeing domestic buyers compete with European buyers from Italy and Sweden for the final 168 yearlings on offer. Last year’s top price of £40,000 was beaten on two occasions with Catridge Farm Stud’s Monsieur Bond filly (Lot 623) selling to Federico Barberini for £46,000 and Wadacre Stud’s Lethal Force colt (Lot 581) going to the bid of Bobby O'Ryan and Keith Dalgleish for £41,000. “Following a stunning renewal of the Premier Sale over the last two days the Silver Sale was always going to be in the shade. “This is a day that has performed in the sales ring and on the track over the last two years so it is a little disappointing that it has been unable to at least match last year’s figures. However we would suggest that today’s trade is perhaps symptomatic of the market in general over the last few months as the best are selling very well, as we saw over the last two days, but there is increasing selectivity as the foal crops grow again which is clearly illustrated by the fall in the clearance rate.